I know I haven't written in a while. It's difficult for me to write about woodworking when I'm unable to make any sawdust, thankfully I only have one more week of non-weight bearing and I can afford to stand in front of my workbench again. It seems like I've been away forever. I have been doing a lot of reading lately, Since getting laid up I found a ton of used woodworking books on eBay and I took advantage. 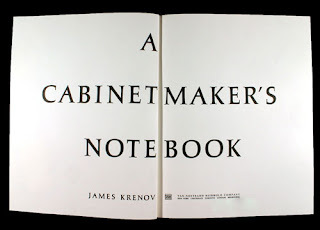 I had already read James Krenov's "The Impractical Cabinetmaker" but I acquired and devoured both "The Fine Art of Cabinetmaking" and "A Cabinetmaker's Notebook." 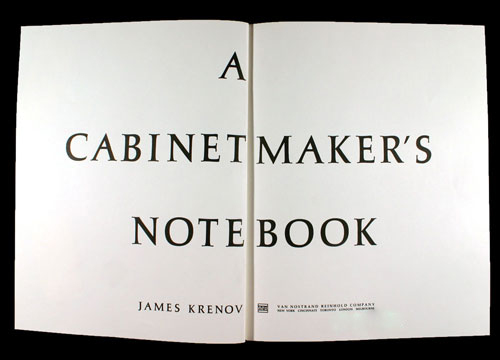 I adore and identify with Krenov's take on woodworking and I can see the influences of his writing into a book I have taken to as a great inspiration "The Anarchist's Tool Chest." Infinity, my nine year old daughter, youngest of the crew, has always been glued to my side in the workshop. I playfully call her my apprentice. She is always desperate to build something, nearly anything. "What can I build Dad?" and I admit that is such an open question that before it's power, I'm at a loss for words. I have no recourse but to fall back on the lame line, "What do you want to build?" I sat her down with Mr. Blackburn's book the other day and she was quietly fascinated. The book builds, hand tool skill upon skill, project on top of project, like many books do. But it doesn't complicate with words spent on types of tools or how to use the tools. It assumes you've read the authors other books that already handle this information. I can respect that approach. It walks from a simple path from easy to more complex. 7. A cabinet with half blind dovetails and door construction. 8. A side chair with cabriole legs and chair construction techniques. Finally I had an answer to her question. I believe if we use this book as a manual we can build both her skills and polish mine. Thank you Bob for convincing me to pick it up. The book is out of print but I had no trouble getting a used copy delivered to me through Barnes and Noble's website. I'm sure you can find it through Amazon as well. More importantly, if you are looking for great instruction, information, and podcasts shoot over to The Logan Cabinet Shoppe and check out all the great thing Bob Rozaieski has going on there. Thanks Derek! But I can't take the credit. Christopher Schwarz actually suggested the book to me some time ago in an email conversation he and I had about a project I was contemplating and researching. I do agree that it's a great format though for introducing any newcomer to hand craft. While it is a bit outdated as I mentioned previously, the book has given me some good ideas to play around with. I'd like to see the idea expanded upon and brought up to date with a little more historical input and reference as well ;-). I couldn't agree with the update idea more. After reading the book I think I can really envision what you're talking about. Allow me to recommend ‘Welsh Stick Chairs’ by John Brown. It's entirely about hand work and as much about his philosophy of work as the tools and material of the trade. It’s not a ‘how-to-do-it’ book, though there’s enough info there to make one of his fine chairs. Entirely hand work and as much about his philosophy of work as the tools and material of the trade. It’s not a ‘how-to-do-it’ book, though there’s enough info there to make one of his fine chairs. Sorry about the double posting above.... joys and tribulations of cut-and-paste, I'm afraid. Do you ever get that feeling of deja vu . . . Do you ever get that feeling of deja vu . . . Do you ever get that feeling of . . . Sorry Howard, I couldn't help it. You've got a nice looking blog going there, I'll be adding it to my reader and excited to read where you're headed next. I have heard other people recommend Welsh Stick Chairs as well. Though chairs are a little out of my realm as of right now, I think I may have to peek around and find it. May I also say, writing all the way from Wales, That is awesome and one of the reasons the internet can be such a cool medium.